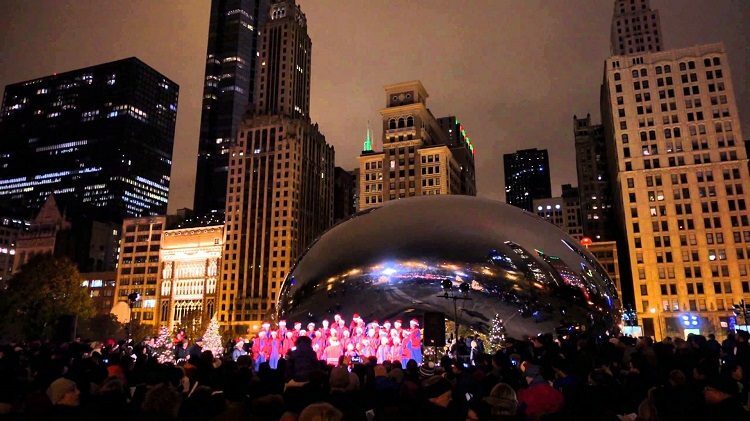 Mark your calendars for each Friday night this 2018 Christmas Season for the annual FREE Christmas caroling at Chicago’s world famous Bean in downtown Chicago! 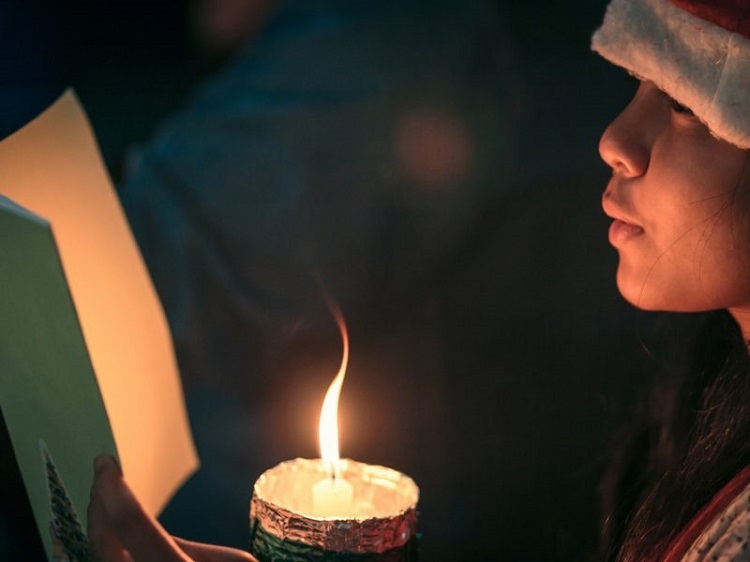 This fun event, Caroling at Cloud Gate returns on Friday evenings takes place from November 23 through December 14, 2018 at 6 PM during the holiday season. Grab some friends and listen to the harmonious sound of local choirs every Friday night in front of Chicago’s iconic Cloud Gate sculpture, better known as “The Bean,” in Millennium Park. They’ll be singing a number of the classic Christmas carols (listen below), and will usually ask the gathered crowd to sing-a-long. Whether you choose to sing or not, the music will put you in the holiday spirit. As you listen, you can soak up the lit-up city skyline views and check out the awesome visual effects from reflections in the mirrored Bean. If there’s extreme cold (as there tends to be in Chicago) the performance times will be shortened. Admission is free. This free program, presented by the Chicago Department of Cultural Affairs and Special Events, in partnership with the Chicago Office of Tourism and Culture, showcases Chicago choral groups and invites visitors to participate in a holiday sing-along. Come out with friends and enjoy this and other annual Chicago holiday traditions in 2018 in Millennium Park. Now in its 18th season, the Chicago winter ice skating tradition at McCormick Rink offers lessons and special programming weekends and during the Chicago Public Schools’ winter break. Grant support for Winter Workouts ice skating lessons is provided by McDonald’s Active Lifestyles Endowment, managed by the Millennium Park Foundation. The McCormick Tribune Ice Rink is located in Millennium Park on Michigan Avenue between Washington and Madison Street. Skating is FREE and open to the public, with skate rentals available for $12 Monday-Thursday and $14 Friday-Sunday/Holidays. Following the 60-minute caroling session, everyone is encouraged to skate at Millennium Park’s McCormick Tribune Ice Rink, one of the most popular winter destinations in the city. Bundle up and get ready to belt out some holiday classics at these festive events that are part concert, part sing-along as local Chicago choral groups lead hundreds of celebrants in song. Santa Claus will join the crowd beforehand, and after the music, head a few steps away to take a spin on the McCormick Tribune ice rink. 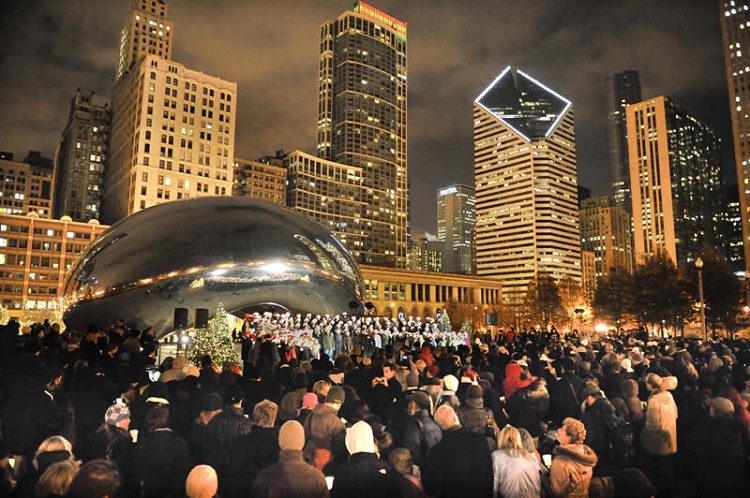 Bundle up and belt out some holiday classics as local Chicago choral groups lead hundreds of celebrants in song. Note: Performance may be shortened in cases of extreme cold weather.